The washing machine is one of the most extraordinary inventions of the modern day technology. It doesn’t only reduce our effort to wash dirty clothes but also make sure that we can do lots of tasks simultaneously saving our time. In Sydney, you will find that every household retains a washing machine and it may be a renowned brand such as Bosch. The washing machines of this brand are pretty known to be well designed, durable and long-lasting. But, just like every other machine, washing machines are apt to face certain difficulties which require immediate attention. Machine not spinning: This could be a simple problem like, water not draining. If your machine does not drain, obviously it will not spin. This problem could turn out to be a serious one, as it may be the motor or the electronic board that drives the motor. Machine won’t drain: Often, it happens that your machine will not drain even after the cycle is completed. This may be because of a blockage or a faulty drain pump and/or Electronics. Reporting fault code: Most appliances these days display an Error message or a fault code. These fault codes give a general guide as to which section is faulty. Always make a note of a fault code when calling for assistance. It notifies that your washing machine is in desperate need of an expert’s inspection. Leaking water: It is one of the most common issues that you may come across while using a washing machine. All machines have Inlet, outlet and internal hoses made of rubber which are susceptible to water damage as they can perish or crack causing a water leak or flooding. All Front loaders have a Rubber Door seal which can also chip off and start leaking. An important note: Turn off the taps connected to your washers when you go for a holiday to avoid flooding. All these above reasons can bother your daily life. Therefore, whenever you start experiencing these kind of issues it is always recommended that you get in touch with our professional Bosch washing machine repair service provider in Sydney. 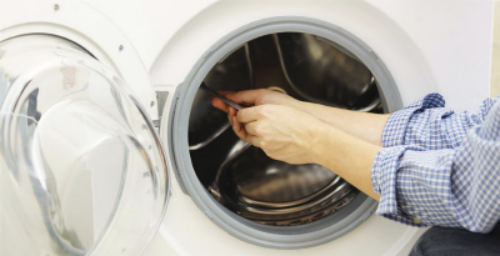 It doesn’t matter what the issue is with your washing machine, we are always there to rescue you. Obviously the job has to be cost effective. All you need to do is to contact us by visiting our website and we will be at your assistance. Being a professional and reputed service provider, we always use genuine spare parts and provide a reliable service to assist you better. We always harbor a team of qualified and trained technicians who have knowledge about diverse kinds of washing machines and their innumerable issues. They are experienced enough to address any kind of issue you might be facing with your Bosch washing machine as long as it is cost effective. In Sydney where household works are gravely valued, we are always here to help you by addressing your washing machine and other home appliance issues in the lowest time possible. We have our mobile vans always on the road to offer you the fastest service. Our technicians are not only professional but also insured for your peace of mind. By farrokh| 2018-01-11T14:40:10+00:00	December 29th, 2017|Appliance Repairs|Comments Off on Consider Approaching “Local Appliance Repairs” to Fix Your Bosch Washing Machine in Sydney!